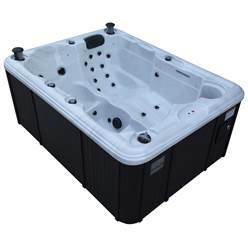 We have introduced a large range of Hot Tubs to our website due to them growing in popularity. We have Hot Tubs fit for 2 people and some can fit up to 6 people. All of our Hot Tubs include delivery and installation in the price so no worrying about how you are going to set it up or move it to your desired area. We are also giving away a FREE Chemical Kit worth £120 with all of our Hot Tubs. Each Hot Tub includes hydro-massage hurricane jets, shoulder and neck jets, back and lumber jets and hip jets which relieve all that unwanted tension from stressful days especially with the added Aromatherapy System. The number of each set of jets are different for different sizes of the Hot Tubs. LED lights are set into the Hot Tubs for under water lighting making your evening or night time soak even more relaxing. Fitted with a 2.0KW AMP heater, providing the spa retains and gains heat quickly even in the harshest winter weather. You will be able to enjoy this tub all year round! For electrical connection a 13 AMP plug is supplied – there is no complicated way of turning the Hot Tub on as you simply plug it in. There is no requirement for an electrician when installing the product – it is really that simple. The plug is a standard plug which will fit in to a normal wall socket. Attached to the plug is a RCD to protect the spa and electrical circuit. However, you must ensure when the Hot Tub is in use that this is the only item plugged into your wall socket. Also included is a MP3 Audio system with a 3.5mm jack and a Waterproof Sound System so you can plug your Mobile phone or iPod in to relax and listen to your favourite music – what better way to chill out after a long week?! All of the controls for the jets, lighting and your music are at just an arm’s length away on a control pad. If your legs are a little short and you’re worried about how you are going to enter the Hot Tub, you don’t need to - a step is included for easy access into the Tub. As if there isn’t already many free items included in the package, there is also a hard hop safety cover with locks included to protect your Hot Tub from bad weather and to keep the water clean and free of bugs. You may be concerned about the running, electrical costs of the Hot Tubs. Well no need to fret as the average running cost is estimated at just £1 a day. These Hot Tubs are strong and have been specifically made to last, so to finish your deal we also include a 2 year on-site Warranty. These type of gadgets used to be a once in a while luxury at your local health spa – now you can bring this luxury to your own home – whatever the weather and for a fraction of the price! You could even make this a feature in your garden space and ensure privacy by adding a decking wall, plants and decorations around the Hot Tub. There are many health benefits of owning a Hot Tub such as relief of stress and pain – especially muscular pain, Arthritis and it can even provide a much better night’s sleep. You could simply close your eyes and think of yourself on holiday! And you wouldn’t have travelled anywhere – Bonus! Your garden is beautifully landscaped and you have a gorgeous log cabin for summer parties and relaxing evenings - so what’s next? The answer is a hot tub! Hot tubs are rapidly becoming the must-have accessory for couples and families who work hard all week long and who want to make the most of their leisure time. You might already be accustomed to enjoying the benefits of a hot tub at your local gym, but it’s a lot more fun when you have your very own hot tub at home. Instead of sharing the hot tub with random strangers, you can enjoy a long, relaxing soak with family and friends, or even on your own if you need a bit of “me time”. There are numerous health benefits associated with using a hot tub Jacuzzi. § Stress relief – relaxing in a hot tub at the end of a stressful week is bliss. You can practically feel your worries seeping away into the water as the tension in your body eases and all those niggling worries disappear. Hot tubs with spa jets are particularly useful in this regard. By placing your feet over the water jets, you can enjoy a pleasant reflexology foot massage, which should help to improve your mood and feelings of well being. An added Aromatherapy System will make your hot tub sessions even more relaxing! § Cure sleep problems – Insomnia is a very modern affliction. Often it’s caused by an inability to switch off after a long day, so anything you can do to relax the mind and body will almost certainly help. Hot tubs are great for this – nothing beats lying in a hot tub late in the evening, a glass of wine nearby and some relaxing chill-out music on the iPod. If this doesn’t help you sleep, nothing will! § Pain relief – As anyone with aching muscles and joints knows, soaking in warm water is a great pain relief strategy. A hot tub is great if you or a family member enjoy pushing your body to the limits in the sporting arena. Weekend warriors will find a hydro massage hot tub highly effective at soothing aches and pains. The heat from the water, combined with the massage effect of hot water jets, will relax tight muscles and ease inflammation, thus speeding up recovery time. § Ease arthritis – Hot tubs are great for people with arthritis and other musculoskeletal disorders. Relaxing in hot water improves circulation by dilating the blood vessels. If you suffer from arthritis, this will loosen up your joints and make movement easier and less painful. Improved circulation from soaking in a hot tub can also improve heart and lung health. There are other benefits to owning a hot tub: a hot tub Jacuzzi is great for outdoor entertaining. We supply hot tubs large enough to accommodate up to six people, which are ideal for parties. You and five friends can have lots of fun chilling out in the tub after a summer BBQ or, if you’re feeling brave, enjoying a soak in the hot water while surrounded by a snowy garden. Once upon a time, the only places you might have seen hot tubs were in celebrity magazine spreads or if you were lucky enough to visit a spa hotel. Nowadays, hot tubs are not just toys of the rich and famous – anyone can own one. Hot tubs are no longer ridiculously expensive to buy and install, and since they only cost around £1 per day to run, you don’t need to be a premier league footballer to have one in your back garden. We offer a full installation service for hot tubs, so all you need to do is decide where the best location is. Hot tubs need to be connected to a power outlet, so do bear this in mind when choosing a suitable location. Lots of people opt to have their hot tub installed on a patio or decking area, but anywhere within easy reach of changing facilities will do. Consider screening in your hot tub if you want some privacy, and don’t forget about lighting – LED underwater lights look incredible at night. Out hot tubs come with everything you need to have a safe, fun time, including a safety step and hard hop safety cover with locks included, to ensure small children and pets don’t accidentally fall in. For more information about our hot tub range, give our customer service team a call today.